Thanks for being awesome and for sharing so much. We will miss you terribly. 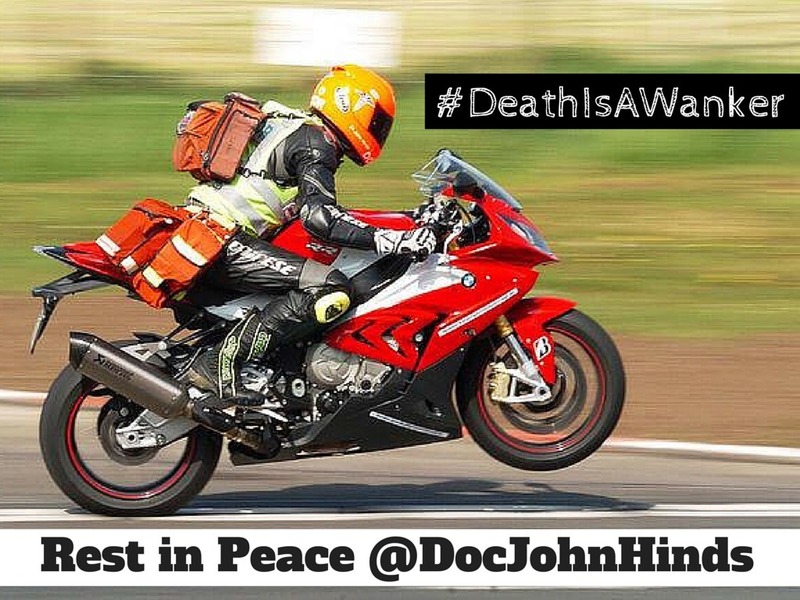 #SMACCfamily those who wish to pass their condolences to @DocJohnHinds' family, please tweet / DM / email me and I will collate and pass on. Michelle Johnson’s beautiful words at Life in the Fast Lane. Ride on. Skip to the end of this podcast mini to listen to a special recording of Danny Boy dedicated to John. Recorded by the Irish Youth Choir as conducted by Greg Beardsell. A youtube tribute published today. Next: Next post: John Hinds: Crack the Chest. Get Crucified. Devastated. Dark day for NI, motorcycle racing, prehospital care, critical care medicine, and FOAMed. John was inspirational insightful and hilarious and I’ll greatly miss his Twitter banter, his talks at conferences and his general take on life. My heartfelt condolences to John’s family. Northern Ireland, pre-hospital, trauma & critical care have lost a trail blazer and a champion. The FOAMed world is united in its grief. RIP John, you were an inspiration to so many. Awful news. Never actually met John but had listened to many of his #FOAMed presentations and like so many was inspired by and learnt so much from him. So much achieved but sadly gone too soon. Thinking of his friends and family. A true loss. My condolences to his family, friends and colleagues. RIP Dr. Hinds. I feel like I know the guys behind the voices on RAGE and SMACC talks but sadly, will never get to meet Dr Hinds. I hope his loved ones know his voice carried far and and will be remembered. I’ll keep the lessons close. Thanks John, rest in peace. 1st question: how does one rotate at your icu? even in a preceptorship/shadowing your practices? Unusual question to ask but I am an emergency medicine attending at New York Presyberian of Queens, formerly New York Hospital Queens. 2nd question: what was the training model that Dr. John Hinds mentioned using to practice ED thoracotomies. I teach at a simulation lab and wish to train the residents without buy a pig to sacrifice for their training.